N-Fab Black Podium Steps are now available with a third step for easy access to you truck bed. These bed access steps are constructed out of a 3" diameter tube of stainless steel, powder coated black, so it is designed and manufactured to take any abuse you throw at it. Not only are these strong, but the multiple-stage powder coating process ensures an even coating of powder, providing excellent durability and resistance to corrosion and other elemental problems. These hoop steps feature the all new expanded and enclosed sure-grip step, which allows for safe and secure stepping in and out of the cab or bed of your truck. These Podium Bed Access Steps are also perfect for both stock or lifted trucks due to the nature of the lowered hoop step. 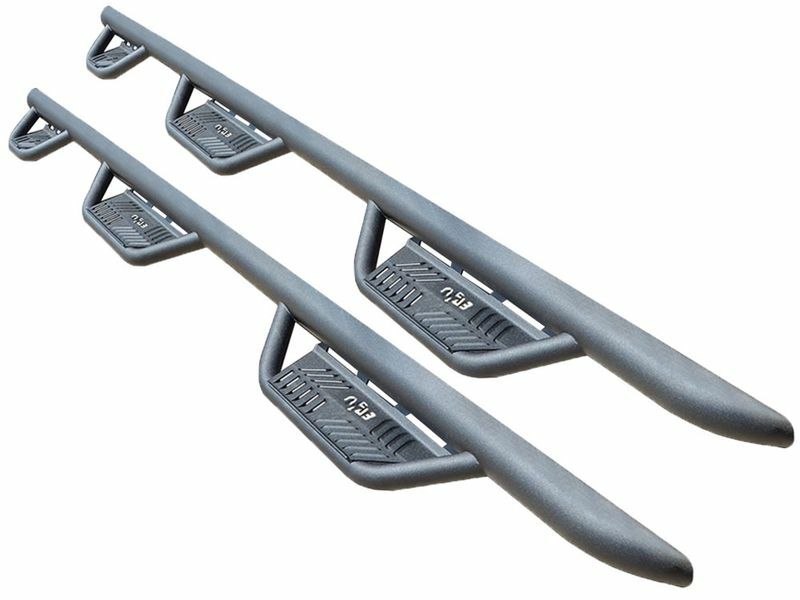 These nerf bars are backed by a limited lifetime warranty on the construction with a 5 year warranty on the black powder coat finish. Installation is also easy since all brackets and hardware needed to install is included with your bars. Although it is always easier with an extra set of helping hands, the no-drill installation of these Podium Steps will be completed before you know it. These nerf bars are a great addition if you are looking for a secure hoop step that still looks good and will last a long time. If you have any questions regarding the Podium Bed Access Nerf Bars, give us a call and we'll be happy to assist you.